The Hamsa symbol is showing an open right hand, valued as a symbol of protection by many cultures throughout history, and is said to be a defense against the Evil Eye. 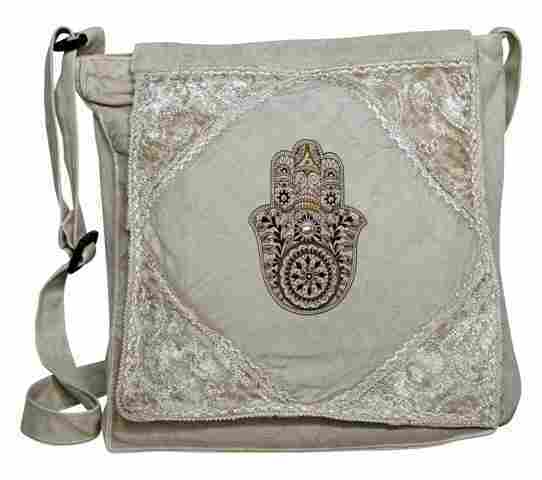 So if you feel in need of extra good karma in your life, this bag is for you. Let this embroidered velvet/rayon bag help ward off any bad vibes that may come your way. This bag measures approximately 12" x 13" and features a zipper and flap closure. Also comes with an adjustable shoulder strap. This bag comes in a variety of earth tone colors, one of which will be chosen for you.